Midland boy’s JV faced a tough and talented Birmingham United squad and came away with a 13-9 victory. 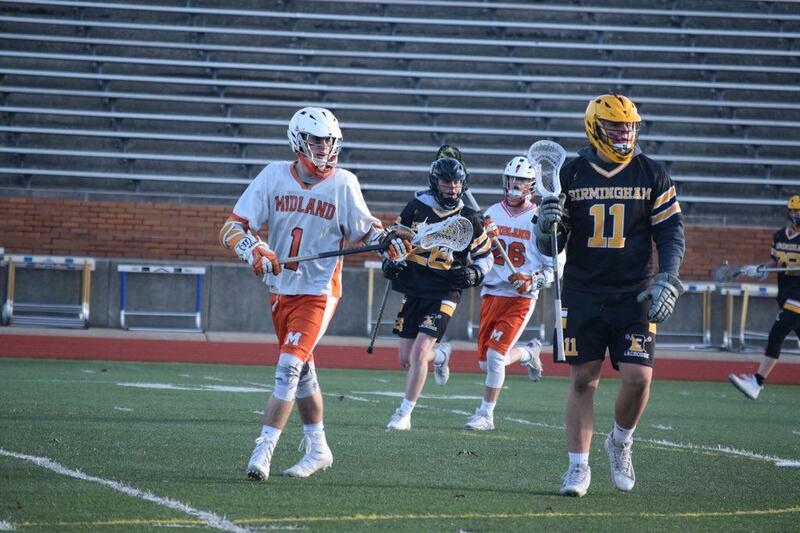 Midland jumped out to an early lead, but Birmingham stormed back through great face-off execution. Midland’s halftime adjustments at the face-off ‘x’ proved to be the difference as they controlled the second half scoring 5-2. Scoring leaders for Midland were Ryan Pomranky with 6 assists, Cal Stearns with 4 goals and Jason Labby with 3 goals and an assist. Garret Wilson and Kyle Leigeb each had 2 goals while Tucker Pomranky and Sepp Pitt added 1 goal apiece. Connor Moening and Payton Valley each added assists.